-header Print a header line, consisting of chrom, start, end followed by the names of each input BEDGRAPH file. -names A list of names (one per file) to describe each file in -i. These names will be printed in the header line. -empty Report empty regions (i.e., start/end intervals w/o values in all files). Requires the ‘-g FILE’ parameter (see below). 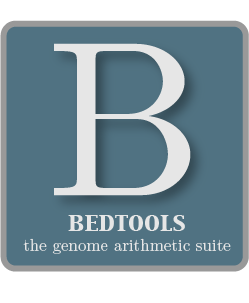 -g The genome file to be used to calculate empty regions. -filler TEXT Use TEXT when representing intervals having no value. Default is ‘0’, but you can use ‘N/A’ or any other text. 5.23.5 Include regions that have zero coverage in all BEDGRAPH files. 5.23.6 Use a custom value for missing values. 5.23.7 Use BEDGRAPH files with non-numeric values.